Some years back the media used to regularly carry out campaigns about adulterated sweets around Diwali while the same jerks will tour gluttony, muttony areas during Eid to tell us how great the road-side food is. And for a couple of years the focus has shifted to exemplary love for dogs and cats who are offended by crackers. This is never complete unless some Bollymoron sermonises the world about it. Seems like the only time Anushka Sharma really over-loves animals is when they are chopped, skinned, boiled or roasted or fried and served to her on a plate to gobble up. Come Diwali, she’s worried about her pet and how the world tortures it with crackers during Diwali. There was some other media-moron who likes her meat dripping with blood, so it’s okay when streets are littered with blood from cows and goats slaughtered by her lovable chefs. 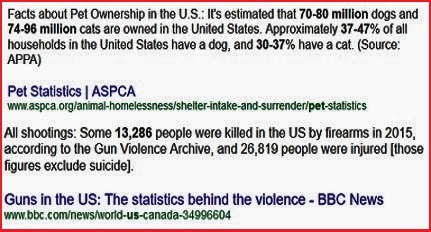 If you add up dogs and cats in the first image of the statistics above that is around 150 million pets. That figure is for a population of just over 300 million humans in the US. I don’t have any reliable figures for India but could find this article which estimates the figure of Indian pets at about 10 million in 2011. And the US does have other “loud crackers” which claim lives. Guns killed over 13000 people and injured over 26000. All the reports on the statistics hover around these figures for gun-crimes. I am not aware how many dogs were killed or lost their hearing due to firecrackers. Hope someone finds the data on that. The activist-jerks haven’t stopped at mere public campaigns. 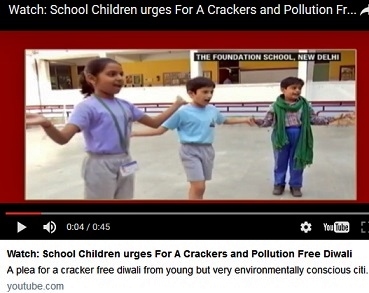 They have even petitioned govts and the Supreme Court for a ban on crackers during Diwali. Now, you have to wonder why they want a ban on crackers ONLY during Diwali. 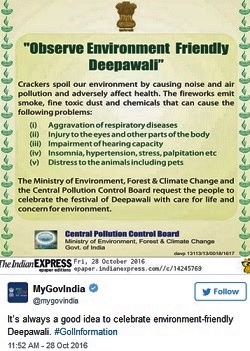 Are crackers used only during Diwali? These are used even in weddings and other occasions. The worst offenders are those wedding “Baraats” that burst fire-crackers on public roads with their long procession. They cause nuisance to other users of roads and block traffic. Fantastically, these activist-jerks used “three toddlers” to file the petition in SC. The SC rightly threw it out. It escapes general notice but people may have reduced usage of printed greeting cards in large numbers. So maybe tell them how many trees we may have saved. Cracker use in Diwali has also reduced to a good extent and is now done more responsibly. But Diwali without the sound of crackers and sparklers and “Diyas” and lights would be bizarre. So, celebrate with greater joy and enthusiasm. A HAPPY DIWALI to all … regardless of the Cracker Whackers. Good piece. I have seen industrialist complain of so many festivals and so many holidays. Workers leaving jobs and reporting erratically after festivals not immediately the next day. These people forget that they are in the business and the eco-system because of the culture and social milieu. It pains when they are dependent of overseas sales and do not mind vacations of Europeans and Americans in July or Dec. We are taught to denigrate everything that is Indian and understand with empathy for everything foreign. So is for crackers. We are asked to favour Odd-Even but not smoke free technology. I am very sure how highways in brain are sabotaged by so called educated protagonists against Indian ethos backed by Indian promoted newspapers like Dainik Bhaskar for waterless Holi - they run a campaign for Tilak Holi for several days. And hailing that man as some messiah, the greatest genocide of civilizations was carried out. ...LOL!!! Blasting a cracker is my birth right similar to those killing lakhs of goats and cows on bakrid and christmas....there was water pollution during these days with skin and blood of goats and chicken during these festivals ....why ignore them?? It is really sad that Sri Narendramodi, PM has written a personal open letter urging not to use crackers. 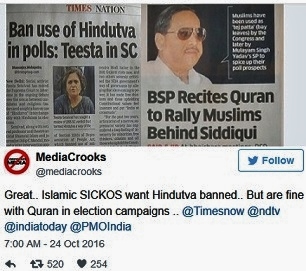 BJP has never been a party that espouses Hindu issues. We are asked to choose between the devil and the deep sea. VHP should start a 'Bhartiya Hindu Party'. They enjoy rave parties which cause huge disturbances to the public. They participate in baarats where crackrs were burst and play huge drums for the entire night. They eat all kinds of living things that can be cooked. But they are worried for "Their Pets". Not for all street dogs, street cats, brids etc., But only for their pets. what a shame. Happy Diwali/Deepavali to all, and let's burst more crackers this time and each time than the previous year !! Pls use pro party hash tags generated by BJP media cell, to propagate our own agenda against RTE, Freedom for Temple, Pollution free Diwali etc. Happy Diwali. A Diwali without crackers is no Diwali at all. Instead of bursting crackers on the roads, we could have some designated spaces in all muhallas. All kids and adults could gather there and burst crackers. Might be more fun that way. Happy Diwali. My grandmother used to say: Dadyaa kolo te Rabb vi dardaa ve. In Punjabi it means even God is afraid of rogues. V true. Americans r devoid of maintaining human relatioships n so turn to dogs n cate etc to shower their conditional, no talk back love. But hv u ever heard americans campaign a "no christmas as it is tree felling"?? No!! Thewhole western countries celebrate christmas but never compromise their tree xutring right for christmas...doesnt dumb libtard notice this?? As for Indian strays...well these strays actually r harmful not only to humans but theu alao destroy the whole animal kingdom around them by killing other animals like squirrels,peacocks,hare,snakes,birds etc...now these poor animals r actually more imp part of our ecosystem rather than overpopulated strays. Dont pseudo animal lovers see the environmental imbalance caused due to strays killing other animals? If they love the strays so much they shd pick them all off the streets/hills etc and tend them at their own home. Thirdly- only hindus r targeted..not a word for the bakri id,tajia etc...remember the video where the peta activist was hounded for even talkimg about animal cruelty to ROP ppl?? Sickulars shd first b made to change ways of cults that still live in caveman age (n treat even humans at par with aninals even today) and then speak abt hindus who r already far progressive with changing times. So many party^minister convoys dont pollute? Party banners, flex huge photos dont lead to plastic waste?? Very well presented.Compliments.BJP is being stupid if it chooses to join those brainless Bollywood girls.Same crowd tells you to eat beef.Maximum noise pollution is caused by secular,Bollywooded Hindus on 31st December every year.We don't know if any of these crooks has ever objected to 31st December celebrations.All TV channels too create so much of noise on that day.You are right about Hindus having reduced the quantum of noise polluting crackers.Hindus have seen it all and survived through millennia by adopting and constantly changing.Our ancestors ate beef, then they saw the economics of cow protection and they started worshipping cow.Same for languages,clothes,education,social customs you name it! Greeks,Egyptians,Mayans,Romans refused to change.Reason why their culture is extinct.Hindus will be around to witness the "KAYAMAT" and Resurrection.Ms Anuksha Sharma's ancestors have ensured that. U say BJP is being stupid. Please note the sermon of Modi on this topic. I wasn't too keen on crackers, but reading this article many pieces have fallen into place. Yes, there IS a pattern to consistently knock Hindu festivals on some pretext or the other. Yes, i do have a good four legged friend, a somewhat mixed-breed German Shepherd, but she doesn't seem to care much about crackers one way or the other. And just because bursting crackers seems to irritate Libtards, Commies and missionaries no end, i've decided to burst some this Diwali. Just a small way to say FU to them. And why these people are not bothered about the misery of workers engaged in the cracker industry ? Why they want them to become jobless? 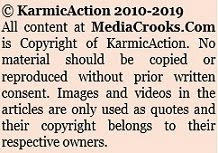 What happens to lakhs, crores already invested in this business? They are more worried about Loss of KaranJohar. Since it time around when everyone seems to become a environmentally responsible person be it celebrity, politician, journo, activist etc. and GoI also joining the bogy It's time to ask how many drains and nallas joining the river Ganga and other important rivers have been stopped by our Uma Bharti ji ever since she assumed her office. Happy Diwali Ravinar. As usual very timely very poignant and hard hitting. We Hindus have lost the plot since the day Porus alone fought the invader. Rest is history. Honestly..who we are blaming here...it's anyways Hindus sermonising Hindus as usual...I was talking to my Muslim friends...he said why you are blaming us for your Hindu hypocrisy? he said Hindus are themselves ashamed of their customs and practices and shift blames on Muslims. honestly I did not have any answers on this?. 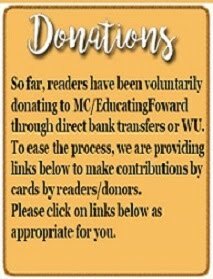 I agree with every bit written in this article...but seriously Hindus by generations are weak and ashamed religion..
Why these libtards are against these Hindu culturual icons becuase, as MC had pointe dout in some of his earlier articles, these cultural things prevent the wholesale soul harvesting of hindus. chrislamists have been practicing this for time immemorial and that is how they have converted one ethnic group after another, as MC had pointed out earlier. Even the Christmas was celebrated by many other ethnic groups as some other festival and that was ridiculed and made to stop and then it came back as the birth anniversary of christ. Ravi - you cracking as usual. Living in 24/7 - 20* temp air conditioned room, travelling 15 KMs in high end cars daily for A/c Gym Facility, Weekend travel to foreign countries - but I will preach for cracker less Deepawali. Very good article hitting noise-makers. First they should ban daily noise generators like Mike's, two & three wheelers & lastly news debaters.india can afford few days of noise pollution then. Hinduism is a open end Religion.we take/follow what is good in others and we change/modify our customs/practices to the changes in the civilisation. Adoptabality is our big asset as well as our weakness.We are no more practising Manu Sharma rituals. Our new generation has spread over all over the world.This new generation does not know why we celebrate festivals and the basic knowledge why these festival's are ooriginated. They think that whatever Developed/ Western nations practice is good and what we practise is bad.Its a problem of Mindset. We should think how to bring change in these people. Secondly in the name of Secular nation , Pampering of Minorities became a strategy to increase their vote Bank.This situation has brought a time where our Cultural values,Traditions and Practices are being questioned by these pseudo liberals. Let's make our Temples be not only a place of worship but also a place to fight against this "Intolerant "people. Let make and encourage every Hindu to attend the temple on Saturday as a practice where we should create Hindhu bhakt Samaj to protect our religion and to propagate the values behind the customs!Unity is the need of the hour. All government has a duty to say politically correct things. So Modi Sarkar sermonizing politically correct "pollution" reduction is understandable. It is not a mandatory requirement. Government just cannot publicly say that it is supporting any polluting activity. A significantly large percentage of the electricity is produced by coal burning. How much more coal is burned polluting environment because of the Christmas lighting decoration through out the world? In USA almost all houses are built with wood since the wood is better insulating material than concrete. 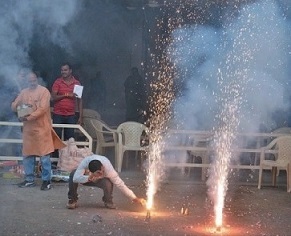 To avoid fire the fire crackers are regulated not because of the noise level (or pollution). Funny, i've never heard these sermonisers preach about a pollution-free new year's day. At the stroke of 12 midnight there's this racket caused by crackers. What happens to the poor darling celebrity dogs then? Not too many days to go for 31 December. Should i wait expectantly for the celeb rants? One thing I would like to correct is that Anushka Sharma has already left non veg foods. She no longer eats non veg foods but yes she always rants only during Diwali/Hindu Festivals. She didn't showed the same concern for animals or environment during Bakrid where lakhs of goats gets slaughtered in the name of religion or during Christmas/New Year Celebrations. Not to forget this celebs live 24/7 in AC Rooms which also harms our Ozone Layer. U get a hollywood ticket..
She is waiting to follow Priyanka Chopra.. They want to take the fun out of Hindu festivals. Also alienate children, so that they grow up as non-practicing adults. No peep on how many trees are cut down or paper wasted on Halloween. Because they are "cool" festivals see. Actually what they want to see in India is: "Rama-less Ravan Leela".